Having a web presence has become essential for nearly every business or organization. An often overlooked and misunderstood Internet service is web site hosting. Choosing a good web host can be daunting as there are thousands, each with its own array of services and pricing and each handles support differently. Many hosts do a wonderful job marketing their services, luring you in with low prices and/or extraordinary claims such as 100% up time or unlimited bandwidth. But once they have you, sometimes service drops off and support requests go unanswered. These companies can get away with this because for many site owners moving from one host to another can be a confusing process. They are willing to stay with an unsatisfactory hosting company rather than take on the task of migrating a site. But if you are thinking of moving your site to our service (or any other), it's really not that difficult with a little planning. We have outlined several steps that should be taken in the following order to minimize any disruption of services and make the move a smooth as possible. 1) Conﬁrm the new service supports your web siteʼs needs. For example, if your site is managed by scripting languages like PHP or needs a database such as MySQL, be sure your new host supports these services. You might go deeper and find out which version(s) of PHP and MySQL are supported. On our servers we use a system that allows us to assign different versions of PHP to each account. 2) If your site does us one or more databases, be sure you understand the process for migrating your database. This can complicate the issue as an Access database will have a different structure than a SQL database. You should check with your web developer about this as he/she will probably need to support your migration if databases are involved. Altjough as we have expertise in both web development and hosting we could provide support at this level as well. 3) Gather information about your hosting account regarding what needs to be migrated besides standard web site ﬁles and databases. For example, email accounts (including usernames and passwords), mailing lists, etc. 4) Be sure you have full access to all ﬁles and data on your current host. This means File Transport Protocal (FTP) access and any database access if necessary. Download all ﬁles and data. 5) Be sure you have control over your domain name and can access the account where your domain name is registered. If you are not sure where your domain name is registered, you can use a service such as Whois which will provide you information about the registrar and who has access to that account. 6) Sign-up for a hosting account on the new host. You should receive new hosting account access information once your account is activated. 7) Upload your ﬁles to your new hosting account. If necessary create any databases and import any data to the new databases. You will need to edit any configuration files that allow your scripts to access the new databases so be sure you have copied the database names, usernames and passwords. 8) Once everything is uploaded and imported, test your site at the new location to be sure everything works properly. Your new host should give you an address to review your site until the domain name is transferred. 9) Create any domain name based email accounts at your new hosting service. If you donʼt have a record of the passwords from the original accounts you will need to make sure your mail clients (Outlook, Outlook Express, Mail, Thunderbird, etc.) are updated to match the new passwords. 10) Login to your domain name registrar account and change the Domain Name Servers (DNS) to point to the new hosting service. This transition can happen very quickly in most cases, but can also take 24-48 hours to propagate throughout the Internet. Because of this potential lag time itʼs possible some people who send you email may have their messages routed to the old host while others will have their messages routed to your new host. Itʼs best to time the DNS switch when email trafﬁc would be the lightest. You might also be able to retrieve any latent messages from your old host by accessing their webmail system. This depends on how their webmail is set up. You might want to check in to that before you start the migration process if missing even one email would be of concern. 11) Once you are satisﬁed you have all data from the old host and the new account is running smoothly then cancel that hosting account. If you are not clear about any of these steps, be sure and consult with your web developer and/or new hosting service provider for assistance. We have moved many web sites, both simple and complex and would be happy to assist your move to our hosting service. We may be able to do this for you for free. 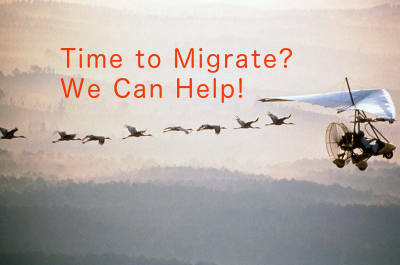 For more complicated migrations, we provide an estimate and would keep the cost as low as possible. Contact us if you have any questions.